The extinction of the dinosaurs, 66 million years ago, is one of the great unsolved mysteries of science. Although a sudden and catastrophic event (an asteroid impact, intense volcanic activity, or both) has been widely recognised as the most likely killing mechanism, some authors contend that environmental changes in the Late Cretaceous were responsible for a long-term decline in the number of dinosaur species. A novel approach, merging fossils, big data and machine learning, may help untangle the conundrum. 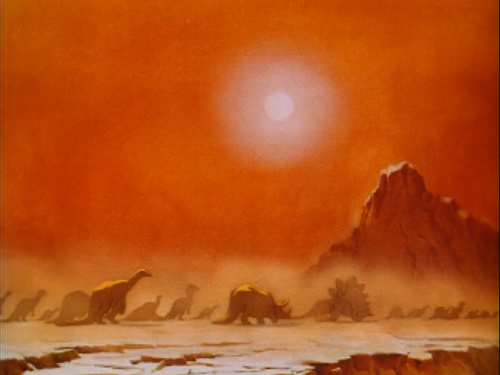 Dinosaurs marching toward the end in a suffocating and hostile environment, from an excerpt of the motion picture movie Fantasia (Disney, 1940). Photo credit: © Walt Disney Productions. In the 1940 Disney classic Fantasia, the evolution of life on Earth flows over the notes of Igor Stravinsky’s Rite of Spring. In a dramatic epilogue to this segment, the colossal dinosaurs cannot cope with the changes of the planet: while seaways retreat and temperatures feverishly rise, these infallible giants collapse on dusty dry lands, taking their last breath in a sun-baked graveyard. The last seconds show only footprints and dry bones, indicating the extinction of these animals that had previously dominated the planet for so long. Although an abrupt catastrophe (either an asteroid impact or intense volcanic activity) is now widely accepted as the culprit for having brought down the curtain on Mesozoic life, some issues concerning life at the end of the Cretaceous are still debated. Environmental changes in the Late Cretaceous (~100 ̶ 66 million years ago) are still considered by many, at least in part, as responsible for an apparent long-term decline in dinosaur diversity. A palaeoclimatic model showing the distribution of surface temperature over the Earth in the Campanian, ~76 million years ago. Warmer colours represent higher temperatures, while colder colours indicate lower ones. Image credit: Alfio Alessandro Chiarenza/ BRIDGE University of Bristol/ GETECH. Reptiles of all sorts and shapes, particularly dinosaurs, dominated the planet during the Mesozoic Era, from 251 to 66 million years ago. Despite the widespread idea that this interval was a generally warm, lush and tropical time, temperatures and other climatic conditions were changing continuously, shaping the distribution of habitats on land, and constraining animals’ adaptation. 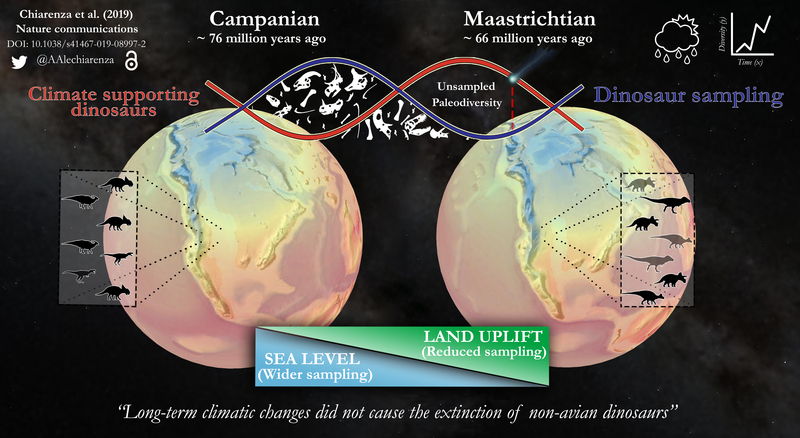 For example, global temperatures declined during the last ~30 million years of the Mesozoic. Smaller-scale fluctuations were also common. 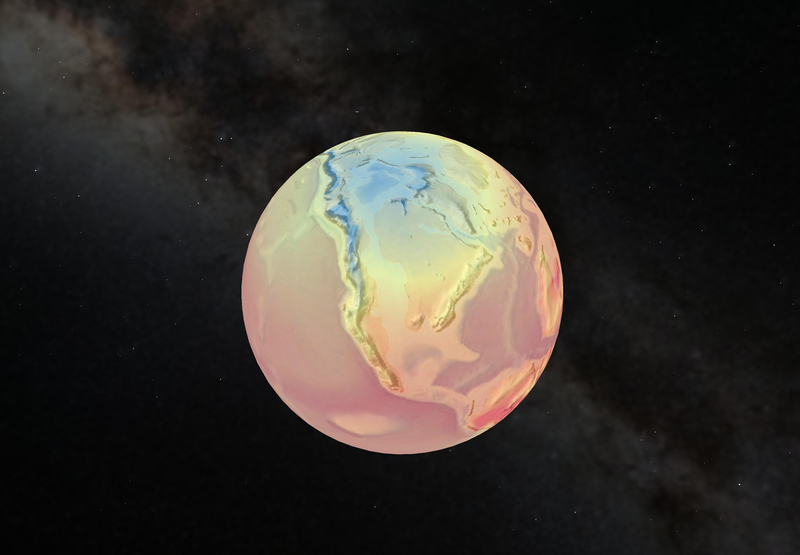 Although tectonic drift had pushed most of the continents to approximately the same position as today by the Late Cretaceous, rhythmic fluctuations in sea levels modified the coastlines of continents. A famous case is the North American continent, which for most of the Late Cretaceous was covered by a shallow and tropical inland sea, called the Western Interior Seaway. 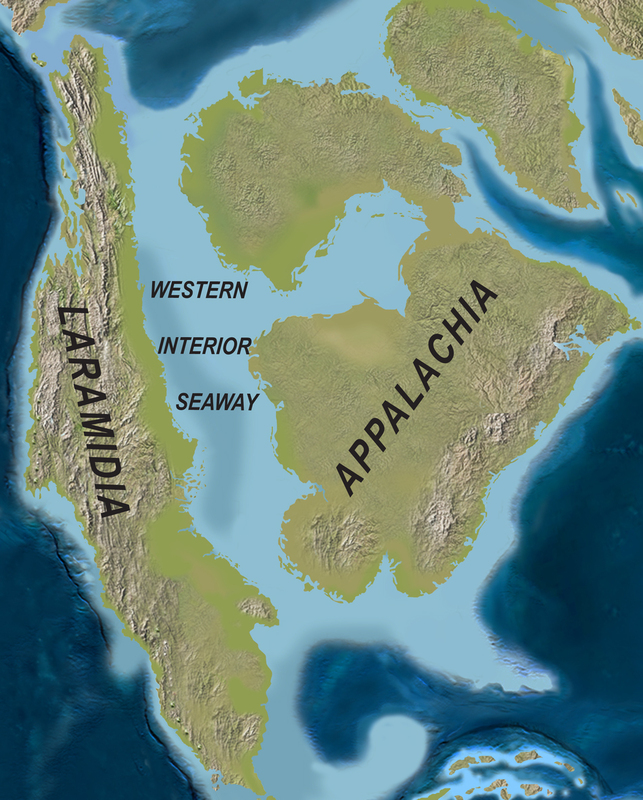 This body of water severed North America (from Mexico northward to Alaska) into two main subcontinents, Laramidia in the west and Appalachia to the east. North America in the Late Cretaceous, approximately 75 million years ago. Image credit: Sampson et al 2010/Wikimedia Commons. These geographic differences likely meant that many areas today looked very different in the Late Cretaceous. For example, the dusty brownish-grey badlands of modern-day Montana and Alberta were once lush, green forests covering the highlands, while streams incised the valleys shaped by the onset of formation of the young Rocky Mountains. These were the habitats roamed by dinosaurs. The North American record is particularly important as it is very abundant, comes from many different states, and in many places can be traced continuously over time. 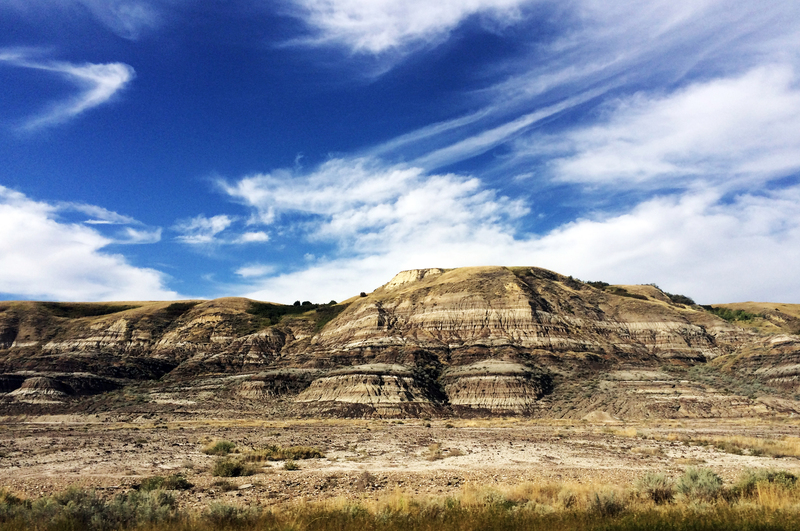 Some areas, such as Alberta, preserve a continuous sequence of dinosaur-bearing rocks from the last 15 million years the Mesozoic. This is important for palaeontologists, as it enables us to sample the different species living at any given time. By mapping the changes in habitats, we can make and test hypotheses on how dinosaur species distribution was being affected by environmental changes. The barren badlands of Dinosaur Provincial Park in Alberta, Canada. These rich fossil deposits were once lush floodplains dominated by dinosaurs, and are now a paradise for today’s palaeontologists. 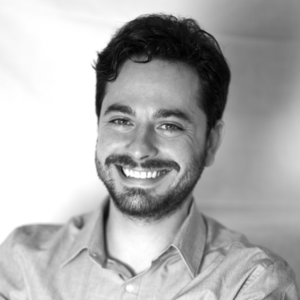 Photo credit: Alfio Alessandro Chiarenza (2017). But there is a big problem with that: the fossil record is notoriously incomplete. For example, forests are covered in acidic soils which favour the decomposition of carcasses, while are usually characterised by limited water supply from streams and lack of sediments that could not be rapidly deposited to cover the decaying corpses. In these conditions, species living there will rarely, if ever, fossilise. It follows that if some landmasses are devoid of particular environments that favour the slow decomposition and rapid burial of carcasses, our window into understanding its ancient biodiversity will always be shut to our curious eyes. North America is also a great example for that: while fossils of the infamous Tyrannosaurus rex and flamboyantly horned-face Triceratops are relatively common in the dry lands of western USA and Canada (what was back then the western subcontinent Laramidia), dinosaur remains are scarce in the eastern half of the continent (Appalachia). But even in the relatively well-sampled Laramidia, some intervals have a better fossil record than others, making inferences on the trends of diversity through time difficult. This “fossil bias” is problematic if we are interested in determining whether dinosaurs were thriving prior to their demise, or if they were already a doomed group, because we cannot be sure that the fossil record provides a true and undistorted picture of ancient ecosystems. Based on taking the fossil record at face value, some palaeontologists have hypothesised that dinosaurs were already decreasing in diversity prior to their extinction, with fewer species in the Maastrichtian (the last stage of the Cretaceous, spanning between 72 and 66 million years) than in the preceding stage, the Campanian (~83 ̶ 72 million years ago). Other authors have incorporated statistical methods in their analyses to cope with bias in the fossil record, although results have varied: some have suggested little evidence for a decline, whereas others have argued that dinosaurs ecosystems were destabilised by environmental changes, and one study has argued that dinosaurs had been in decline for >30 million years. Graphical abstract showing the main findings of our paper: we used climate and ecological modelling to map the abiotic niches of non-avian dinosaurs through the latest Cretaceous of North America. Whilst climatic conditions remain suitable throughout, the taphonomic window allowing the build-up of our fossil sampling decreases toward the end of the Cretaceous. We link this spatiotemporal reduction in sample availability with the rise of proto-Rocky mountains and the retreat of the Western Interior Seaway. Image credit: Alfio Alessandro Chiarenza. In a study published today, my co-authors and I have analysed the distribution in time and space of North American dinosaur fossils using a suite of ecological and Earth system modelling tools. We show that the dinosaur fossil record in North America, for the last 18 million years of the Cretaceous, is more sampled in some areas than in others, highlighting the spatial and temporal gaps in our knowledge of dinosaur diversity during these topical times. We then pinpoint and describe the major environmental drivers affecting this bias. In addition, we test the hypothesis that climatic changes affected the dinosaurs, causing a long-term whimper before the final bang. To look into these issues, we used a novel approach. We apply a method designed by modern-day ecologists to analyse the distribution of species in their environment. This technique, called ecological niche modelling (ENM), combines the climatic conditions in which a certain species lives with a set of statistical methodologies (from simple linear models to advanced machine learning algorithms). This in turn can be used to predict the response of a certain group of organisms to changing environmental conditions, and these predictions can then be projected in geographic space. Consequently, ENM can be used to determine whether or not an area has suitable conditions for supporting a particular group or organisms. We used a large compilation of data on fossil occurrences, collected from the Paleobiology Database, combined with geological data and palaeoclimatic models that simulated the climate of the Cretaceous. We studied how physical parameters such as temperature and precipitation affected the ecological niches of some of the best known and widespread dinosaurs in North America: the fierce tyrannosaurs, the horn-faced ceratopsians, and the duck-billed hadrosaurs. By projecting this information onto palaeogeographic maps of the last two stages of the Cretaceous, we found something quite unexpected: although the climate was changing, the conditions to support habitats suitable for dinosaurs were even more widespread towards the very end of the Cretaceous. Unfortunately, many of these suitable areas are in places that currently do not provide a rich fossil record, such as the eastern part of North America. We then used a combination of geological tools and digital palaeogeographic maps, which merge information on ancient rivers and climatic conditions, to provide information on the distribution of ancient depositional environments. While the results were showing that many areas predicted by our model to be able to support dinosaur communities were not matching potential “fossil factories”, another interesting thing emerged. The further you go into the terminal moments of the Cretaceous, the less widespread these fossiliferous environments were getting, becoming patchier and more clustered in localised areas. This is a problem for biodiversity studies, as knowledge on modern and past ecosystems tells us that the more widespread our sample, the higher the chance to “catch” a more diverse fauna with many different species, increasing our indices of biodiversity. Palaeogeographic maps of North America in the Campanian (a) and Maastrichtian (b) highlighting density areas of dinosaur fossil occurrences. The star in part a represents Dinosaur Provincial Park (picture above). The higher density areas are wider and more widespread in the Campanian rather than in the Maastrichtian, highlighting a spatiotemporal bias in the dinosaur record for the latest Cretaceous of North America. Image credit: Chiarenza et al. 2019/Nature communications. The retreat of the Western Interior Seaway in the Maastrichtian, and the rise of the infant Rocky Mountains, changed the geography of the North American continent, affecting the distribution of environments adapt to preserve dinosaur carcasses and turning them into fossils. The results of our study suggest that non-avian dinosaurs were extremely adaptable animals. Climate change over prolonged time scales was not causing a slow decline of dinosaurs through the last stages of the Cretaceous. With this new view, integrating climatic, ecological and geological modelling, we are able to picture a different model for the diversity of dinosaurs. Any evidence for a purported decline may be more likely referred to a reduction of our sampling window, with fluctuations in biodiversity in the last million years of dinosaur reign most likely independent from direct, long time scale climatic forcing on their biology. Dinosaurs were likely not terminally doomed to extinction at the end of the Mesozoic, when the asteroid declared the end of their reign, leaving the planet to animals like mammals, lizards and a minor group of surviving dinosaurs, birds. 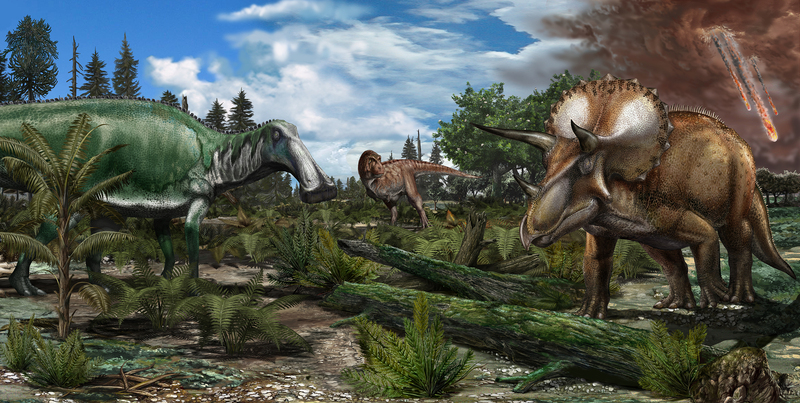 Reconstruction of a late Maastrichtian (~66 million years ago) palaeoenvironment in North America, where a floodplain is roamed by dinosaurs like Tyrannosaurus rex, Edmontosaurus annectens and Triceratops prorsus. Image credit: Davide Bonadonna (www.davidebonadonna.it).